American Girl Crafts are especially designed for girls 8 to 12 years old to encourage development and self-expression. 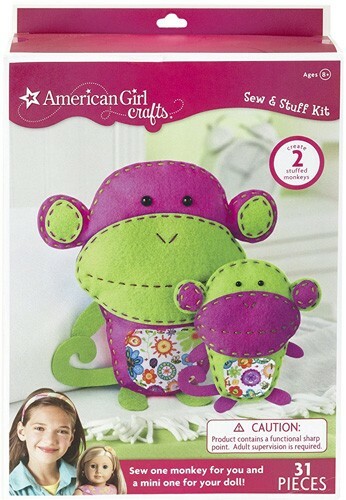 Each pre-cut felt piece in this Monkeys Sew & Stuff kit from American Girl Crafts features perforated stitch guides, making it simple for girls to sew this happy pair of monkey pillows -- one for you, one for your doll! This set includes a project and idea booklet, 22 felt pieces, 4 adhesive gems, 2 bundles of embroidery floss, 1 needle, 1 needle threader, and 1 bag of stuffing.